The clock reads 8:44 AM, Saturday April 20, 2013. I have just returned from a lovely walk in St James Park near Buckingham Palace, the spring flowers abloom and peaceful here in London. The sun shines through the cool (perfect running temperature) air. In 25 hours, I will begin a 26.2 mile point-to-point journey from Greenwich Park west to the Palace winding along the Thames and over Tower Bridge amongst other famous landmarks. I ran this course last year, and I know my second tour will be at once familiar and entirely different. As I approach my 40th marathon, a demarkation line has been etched in all of our consciousnesses. 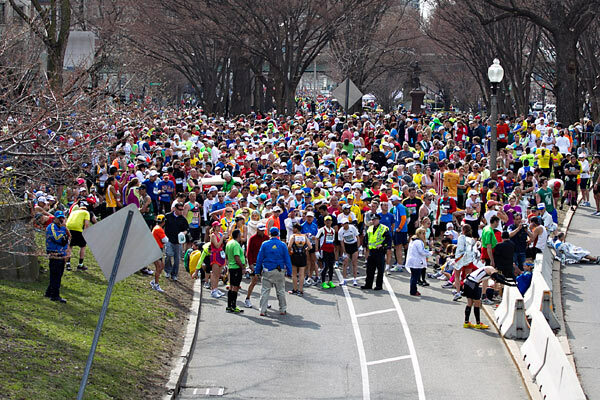 That happened 5 days ago at the world shattering end of the Boston Marathon. Like 9/11, 7/7 or, as my mom reminded me, January 28, 1986 when Challenger exploded, this journey is point-to-point as well. Time's arrow is decidedly one directional. Mentally, I began writing this post even as events unfolded last Monday. Yet, until this morning, I did not even try to start writing. Sure, as I ran on Tuesday and Thursday this week, mentally I composed the words, trying out angles in my mind as to what to inscribe on my blog. I knew that I had to say something. Even if no one reads these words, I cannot let the tragic events impact on me go unwritten. This was emphasized when my friend John sent me a note yesterday wondering if I was ok given that I had not sent out an update to my mailing list. Perhaps, I needed to know of some sort of resolution, as happened Friday in Watertown, before I could really get my head around everything. I first learned of 9/11 from a phone call from my boss and friend Mark who told me to turn on the TV. I was getting ready to take my son to school and head to work. I found out about Challenger when passing our central TV room in my MIT dorm room as my friends gathered around the screen transfixed by the images. As I read the news alert, I took advantage of streaming video to tune into a local Boston station. 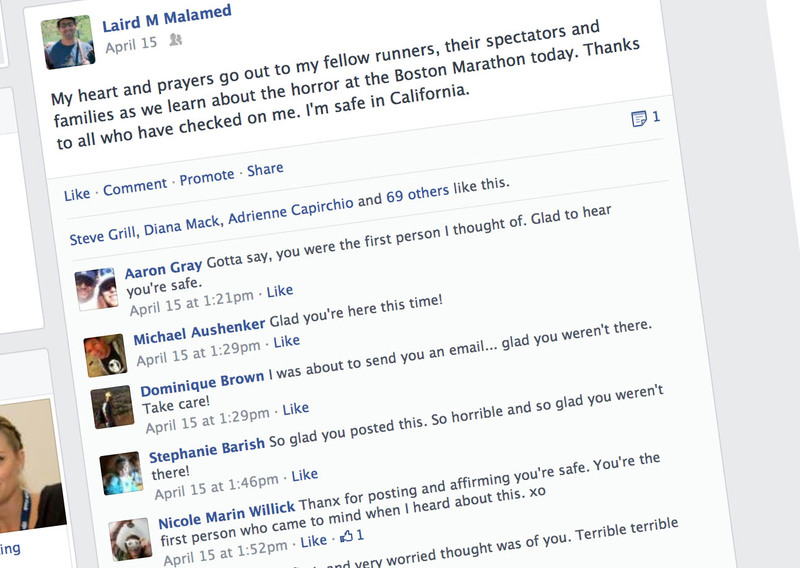 Very quickly, I saw the explosions caught on personal phones as well as the marathon finishing line cameras. Seeing runners knocked down, security personnel scrambling to help the injured and general chaos was shocking. The street was familiar to me. How many times had I walked on Boylston? More than I could count. This was happening in Boston, a city I called home for 3 1/2 years during college. A city where I first had the apotheosis to try running a race. A city famous in American history but small enough to be walked in a few hours. A city I relish visiting whenever I can. I found myself unable to concentrate on work. I was glued to the internet, yearning for more information. Questions abounded as I prayed this was a gas line explosion or some other unfortunate but non-deliberate act of nature. Social media like Twitter dispelled this pollyannish outcome as the Boston Athletic Association called the explosions bombs. I started to see images of runners held on the course as the situation became clearer and the race was inevitably and correctly cancelled (after some 17000 of the 23000 runners had finished). My NYC-based racecation running buddy Miri and I started an iMessage exchange as we compared notes from 2500 miles apart. And then I realized that the personal view of this event I was having did not take into account how horrifying this was to everyone. That seems myopic in retrospect, but at the time, I was too engrossed with my own thoughts of marathon running and my connection to Boston. My local family all knew I had not run the Boston Marathon this year as we had all been at a birthday for my sister's mother-in-law the previous night. My lil sis in Colorado knew as well but texted me to be sure. 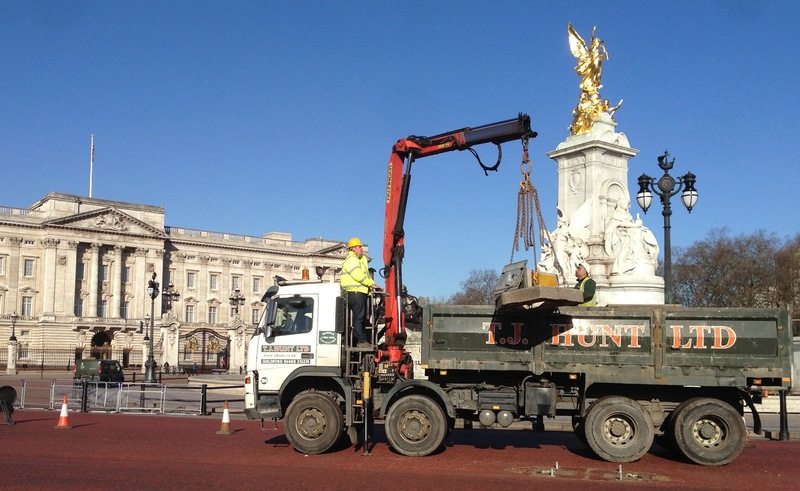 They all were aware that I was coming to London this week. However, not many of my other friends knew for sure. I started to receive pings on just about every form of social media from five continents. Email, text messages, phone calls(! ), Twitter and Facebook. The messages were often urgent. "Please tell me you are not in Boston" came across my screen more than once. As I stared at the horrifying images of limbless victims, I suddenly found myself almost in a riven state. I was deeply touched by my friends concern for me, and at the same time felt almost overly cared for in relation to what was happening on TV. Who am I? I'm just a guy who runs a lot of marathons. I'm running from stuff and towards other stuff. I like to write about that. And I enjoy traveling to run, but it's not life and death. And yet this day had become that for 3 people and their families plus over 150 other victims. Rebecca posited an interesting theory. She said that for my friends, for whom I am the only person they know who runs races like an addict, reaching out to me gave them a chance to connect to this horror. I provided a window into this event. In a small way, my running and writing about it and talking about my marathons for all to see unlocked an ability for others to process their feelings. "My heart and prayers go out to my fellow runners, their spectators and families as we learn about the horror at the Boston Marathon today. Thanks to all who have checked on me. I'm safe in California." This yielded a handful of comments and nearly 70 "likes" in a matter of minutes. I Tweeted a similar message moments later, and that got picked up too. I spoke to my mother around this time who was seeing the news at her work. Her shock at the events on screen was matched by an immediate concern that I was going to be running London in a few days. I said that my plans had not changed, but of course it was still very early. 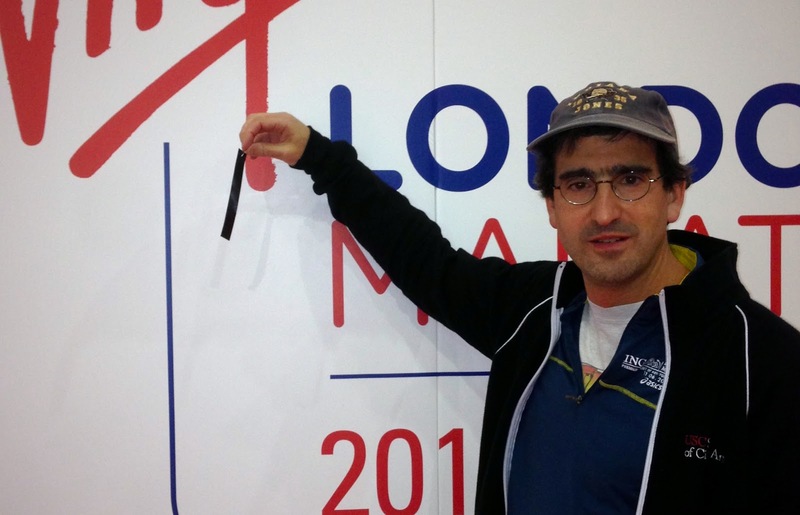 Yet my gut was that unless we knew it was unsafe for sure, I had to run London. In fact, I would be letting people down if I shied away. The only response to terror is to face it. I don't know if that is brave or stupid. 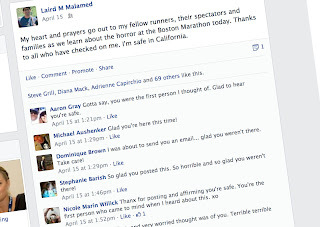 In a small way, my at times obnoxious lauding of my running adventures helped others put some personal face on the craziness and evil of Monday's events. At least I hoped it has. Everything about this terrible situation seems so large even if it is not another 9/11. Flying to London Thursday night, I had no idea what was unfolding beneath me. Yet, as I landed at Heathrow and started to catch up on the news, I found out that once a MIT police officer had been murdered, presumably by the suspects. This led to the Boston Police following a lead of a carjacked Mercedes and into a firefight where one of the suspects was killed after being run over by his fellow suspect brother. As my NY Times app updated, each new entry read like a Tom Clancy novel. And then the images of an armed force scouring Watertown MA began appearing. Was this America? I read an Amtrak train from Boston had been stopped in Connecticut and searched. We had a weekly MIT project call where I learned the school had released the name of the killed officer, Sean Collier, a young and well liked officer. By the time I went to bed, things were still unresolved and on lock down as the second brother was sought. I awoke today to learn he had finally been captured alive. Perhaps this will lead to answers. Perhaps not. You can all search the internet for the latest stories, but I wanted to remark on one Miri told me about this morning. I found this link as well: http://www.telegraph.co.uk/news/worldnews/northamerica/usa/10005932/Boston-Marathon-victim-Jeff-Bauman-helped-identify-bombers.html. One of the most horrible images from Monday was of spectator Jeff Bauman being wheel chaired to the hospital, both his legs missing. Google Mr. Bauman's name to see the image if you do not know what I am writing about. Warning - if you see the full image, it is horrifying but captures the moment more than any other. The break in this investigation came when Jeff awoke from surgery. He immediately asked his brother for paper and pen and wrote that he had seen the one of the brothers drop the backpack. The FBI interviewed him and got a description and that led to finding the footage from the department store security cameras that came out Thursday. Those images then led to many other spectators checking their cell phone images and within hours, a number of clean images were found. By Thursday night, the brothers were on the run. Mr. Bauman is rightly being hailed as a hero in this tragedy. And up there with him is Carlos Arredondo. Mr. Arredondo is credited with saving Jeff's life by holding an exposed artery with his fingers while ripping apart a sweater to create a tourniquet. Yet the story goes further back. Carlos has known his share of tragedy as he has lost two sons, one to the Iraqi war. Upon learning of this, Carlos attempted suicide and was stopped by the army officers who came to tell him the horrible news. That intervention in 2004 may have Butterfly Effected this whole week. Who knows for sure? Perhaps you already have all learned these events, but I relate them here to underscore the interconnectedness of our lives even in ways we do not expect. Big and small. Historians might comment that causality only looks that way in history because we memorialize narratives. However, if that gives us a manner in which to process randomness, the argument is rather moot. That leads me back to my race tomorrow (Sunday, April 21 if you are reading this in the future). To honor the victims of Boston, all runners here in London have been given the opportunity to wear a black ribbon as they scrabble along the course. 30 seconds of silence will proceed the start, and I am sure finishing will be a bit surreal. 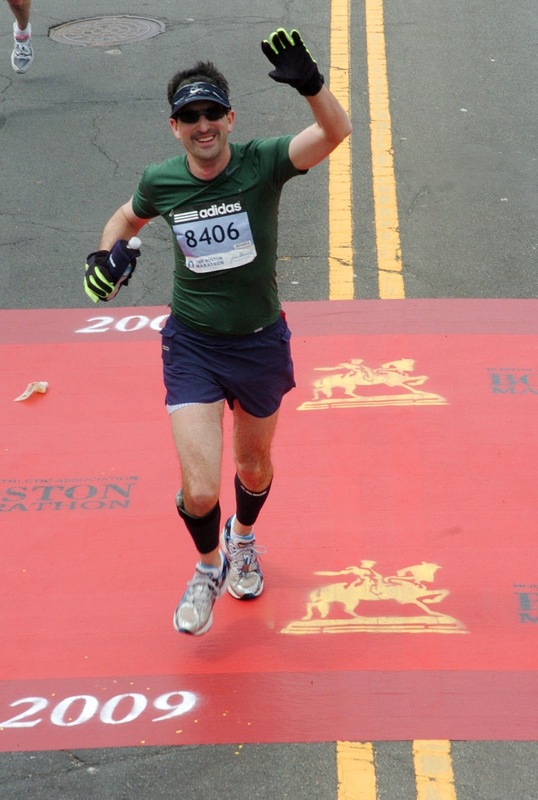 I will be also wearing my 2009 Boston Marathon shirt under my usual Marathon Maniacs top. Do I have any worried about safety? Not really. Security will be super tight, and it appears that the events in Boston, even if motivated from overseas, were localized. That does not mean I should not be wary. 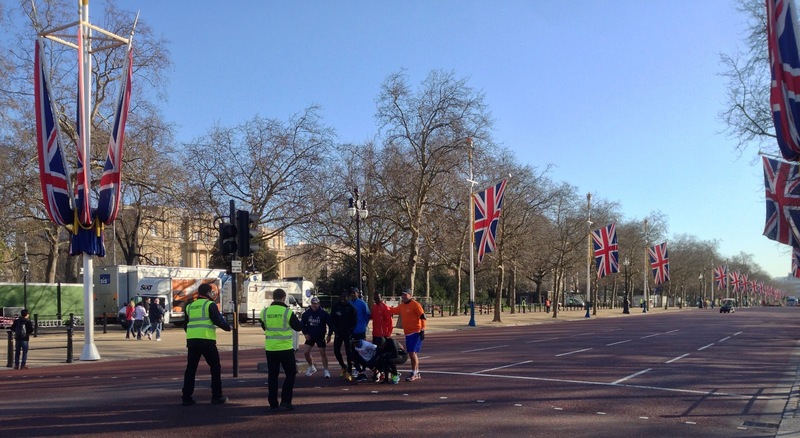 Walking near the finish line area today around Buckingham palace, I cannot but imagine how hard it is to patrol an area packed with spectators. However, for whatever reason I run, I am not running away from something I love doing and that allows me to connect with my friends and family around the world. I am proud to be part of the marathon running community, and I know that every time I run, I do so for more than just myself. Thank you to all of you who looked after me this week. I was both touched and illuminated by your care and compassion. Let us all hope that all of the victims are as fortunate as I am. What a very poignet and thoughtful observation.